“Show me the border,” Diego Adame, Community Organizer with Hope Border Institute and our guide that morning, challenged. From high on the mountain, the city of El Paso, Texas was indistinguishable from Juarez, Mexico. We saw one continuous metropolitan area with tall buildings, highways, bridges, homes, and church towers. Even after he pointed it out, the wall was difficult to find and easy to lose track of. So we drove down the mountain into the side streets of Sunland Park, New Mexico, crossed some railroad tracks, and parked in the sand near the tall metal planks reaching skyward. Three border patrol vehicles shifted nearby. 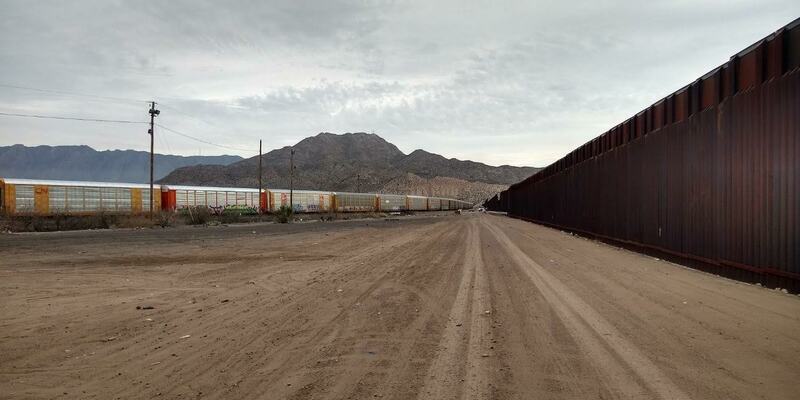 The U.S.-Mexico border from Las Cruces, New Mexico. Here was this wall. The wall that I had come to see. 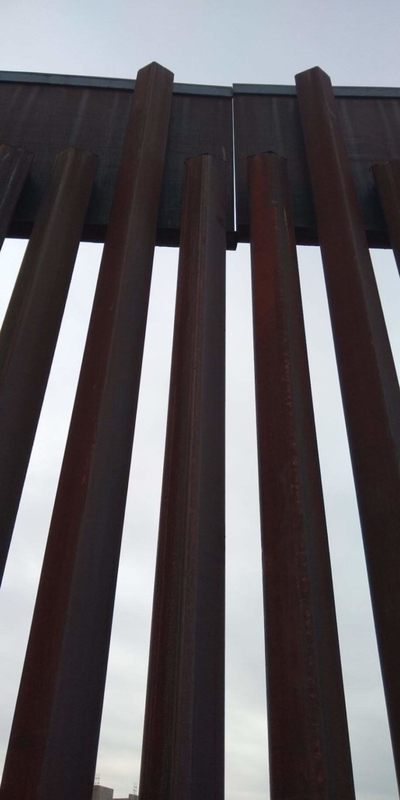 The wall that is creating so much pain and discourse across the U.S. That wall, those slabs of metal are the division… right? Soon, two men approached on the other side of the fence. We started exchanging morning pleasantries, talking about how cold it was outside, joking about the displeasure of having to go to work. They wished us well on our journey to learn more about the border and headed off to start their days. It struck me as we circled up for prayer how typical the conversation was. It would have been almost the exact conversation had we been in line at the grocery store, but instead, there was an 18-foot steel wall constructed between us. 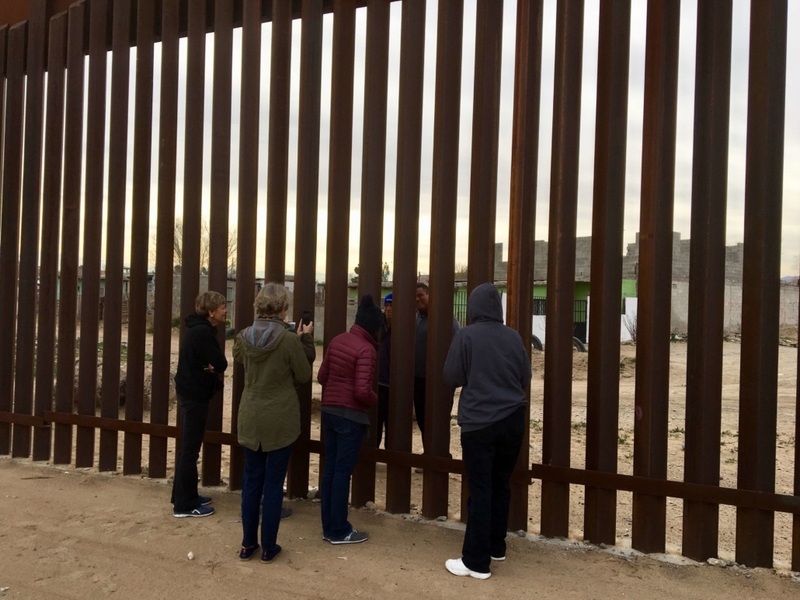 Immersion participants chatting with local residents through the border wall. Later that day we would drive over the bridges into Juarez and visit with people living in the neighborhood of Anapra, feeling welcome, hospitality, and warmth. We came back across, joking with street vendors and tallying up the different license plates going through the border checks fairly easily. Throughout the week, everyone we spoke with living in the tri-state area (Chihuahua, New Mexico, and Texas) had similar sentiments: “ I was born in ________, but I live in _____________ and I work in ______________.” The cities were almost interchangeable. Many people travel frequently—sometimes even daily— between these three states and two countries. And everyone we met was working to improve their community. Returning to the U.S. from Ciudad, Juarez. As the week continued, the wall moved into the background of my thoughts. 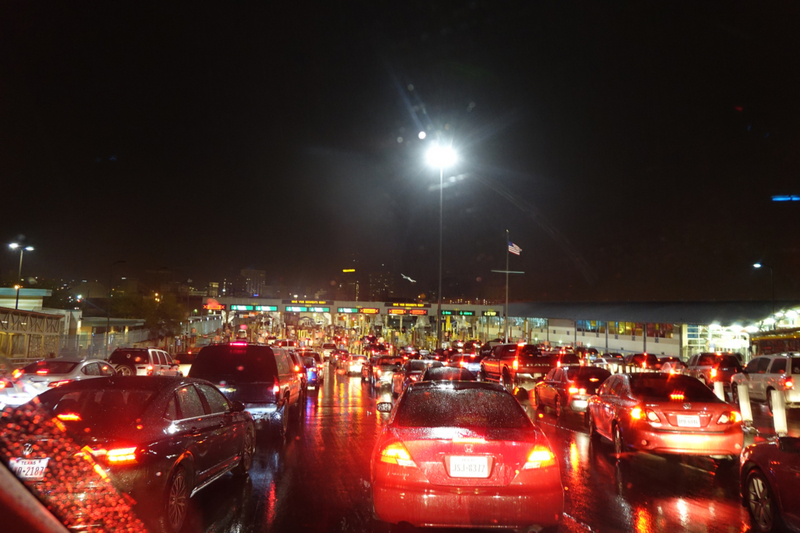 Even as the President was declaring a national crisis and continuing to use it as a divisive measure within the interior, those at the border went about their lives. 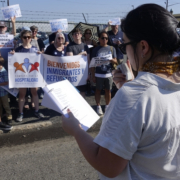 It certainly didn’t feel real later that day as we celebrated Mass at a detention center, sharing in the Eucharist with hundreds of men and women from around the world. 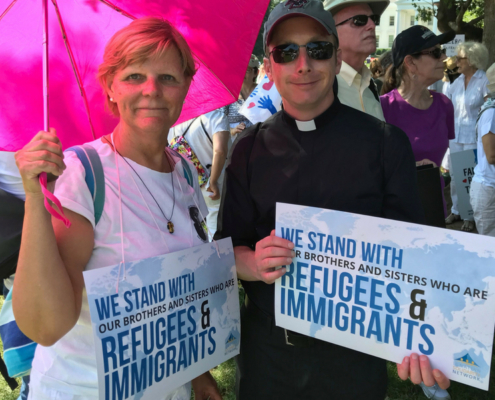 As we entered into communion with these men and women and shared signs of peace and brief conversations, internal and external borders faded into the background. We were Christians, family, one body of Christ. I had the same feeling at the shelter for folks seeking asylum who had been released by ICE. There weren’t divisions just because they had passed through the wall or crossed a borderline. There was no “us” and “them.” There were simply parents sharing understanding glances as children made messes out of cookies and juice. There were weary travelers appreciative of clean sheets and the promise of a good night sleep. 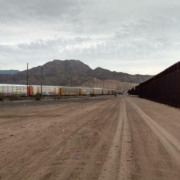 The whole concept of borders was challenged as I learned more about the history of the area; the trade routes, how these Native lands became part of Mexico, then the U.S., and even then, borders shifted between New Mexico and Texas. But the wall is real. Structurally, destructively. 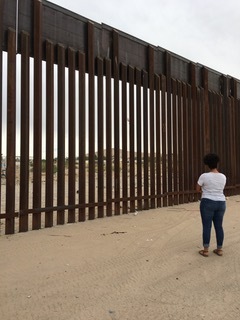 This wall that doesn’t seem real even after seeing it and touching it is being used as a pawn to actively oppose the work of the Eucharist, the work of God. It is dividing the U.S. internally through opinions and beliefs. It has caused thousands of people in the interior of the U.S. to go without paychecks, which means many of them are going without food. And it is continuing to be a physical representation of the idea that some deserve to have the freedoms that the United States offers and that others do not. It’s been said by many advocates for justice that problems at the margins are because of exploitation and lack of knowledge from those in positions of privilege. Faith leaders for centuries have called us “to go to the margins.” There seems to be a pattern here…it is only through encounter that walls fall away. I know mine did. Imagine if someone kidnapped you, and then threatened to murder you. You escape, but you have no support from police to protect you. Wouldn’t you flee to save your own life? If this happened to you, and you managed to get a visa to the U.S., and you declared asylum at JFK airport—you are then shackled and handcuffed. Your luggage is taken from you and you are forced to wear a blue prison jumpsuit. You are taken to corporate-run jail for at least six months while you await a hearing from an immigration judge. Inside, you are offered food which is often inedible. You have little access to medical care. If you are lucky, you have volunteers from a church who accompany you in detention, coming weekly for a one-hour visit. If you are lucky, you have help from a pro-bono attorney, otherwise you will likely be deported, sent back into harm’s way. If you are granted asylum, and you are freed from this nightmare, would you return to the detention center soon thereafter to join a prayer vigil and visit other detainees? Sam, a new refugee from West Africa did just that on Sunday, September 16 in Elizabeth, New Jersey. 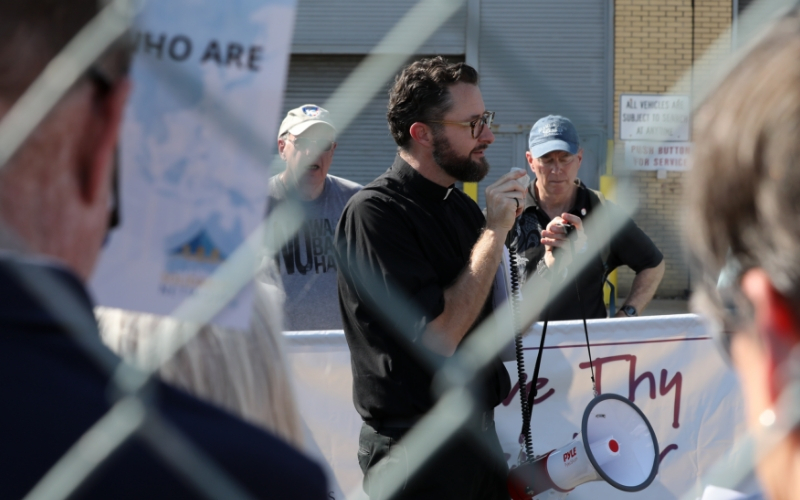 He shared his stories of the terrible conditions in detention, and also led the group in a prayer for the 400 detainees inside who are seeking freedom in the United States. When one of the guards at the Center came outside to dissuade the group from getting close, Sam went and shook hands with his former captor. It was a powerful moment. 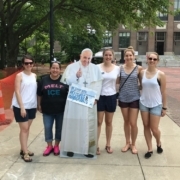 More than 100 parishioners of the New York City Churches of St. Francis Xavier and St. Ignatius participated in the Ignatian Solidarity Network’s Light in the Darkness pilgrimage. 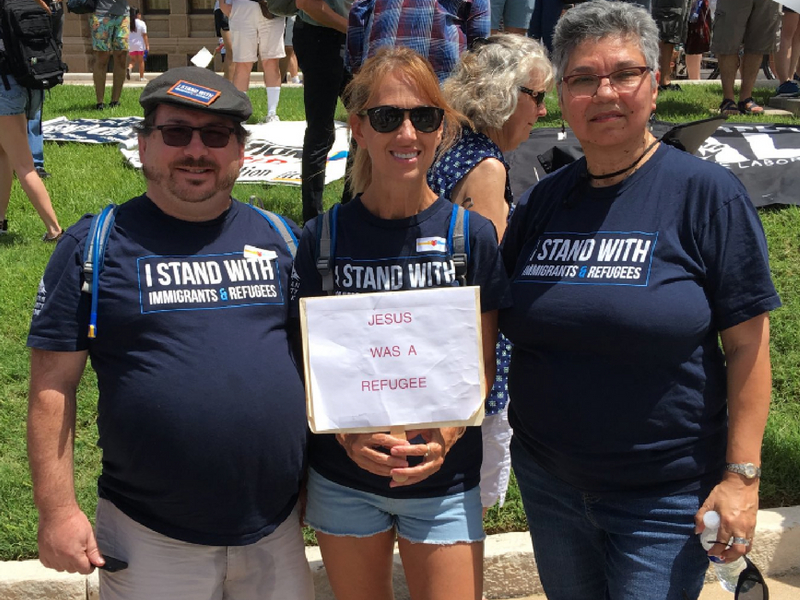 They stood in solidarity with immigrants facing deportation, and with refugees seeking asylum, offering prayers and songs. 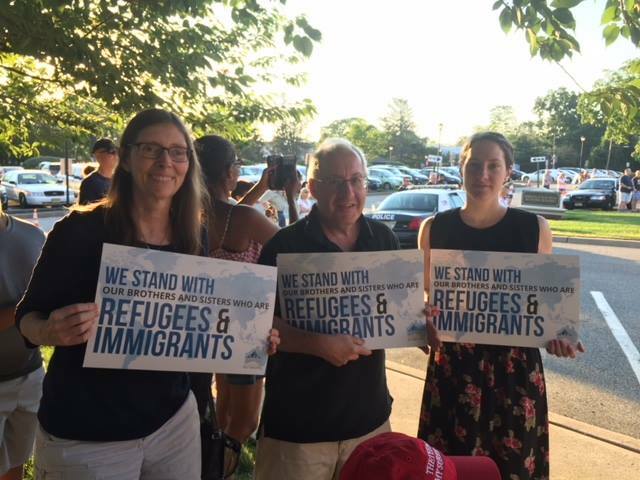 Other groups participated, including the Migrant Center at St. Francis of Assisi, Catholic Worker, and Sisters of Charity of St. Elizabeth. 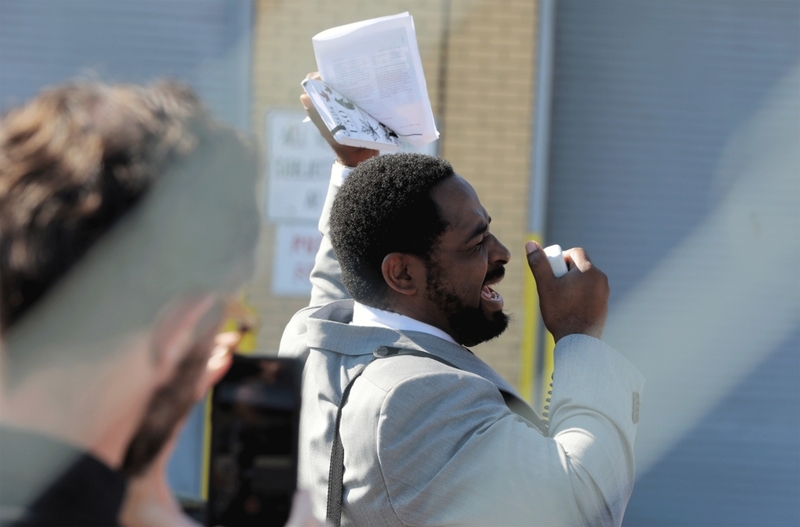 The group walked two-by-two for more than 30 minutes in the heat from the nearest transit stop, past a maze of distribution warehouses, to the corporate-run detention center. When detainees are granted asylum there, they are usually set free in the middle of the night with no assistance to find public transportation to a refugee shelter. Immigrants detained by ICE are held under civil, not criminal, law. According to the International Detention Coalition, dozens of countries only use detention as a last resort for migrants seeking refuge. They require weekly check-ins with immigration court officers or wearing of ankle bracelets. Recent news reports have shed light on the horrific plight of migrant children also being held in detention, separated from their parents. Christ calls us to pray, and advocate for humane policy changes with Immigration Customs Enforcement. Kevin Tuerff is a social entrepreneur, author and speaker. He is passionate about finding solutions for climate change and refugees. Kevin’s hometown is New York City where he is a member of the Church of St. Francis Xavier. His true story of being an American 9/11 refugee is portrayed in the Broadway musical COME FROM AWAY, and in his memoir, “Channel of Peace: Stranded in Gander on 9/11.” He is also an ambassador for Charter for Compassion International. Follow him on Twitter @channelof_peace. When I was in fourth grade, I learned about immigration for the first time. I remember my teacher telling us about Ellis Island and all the people that came into our country looking for a better life. She spoke about European immigrants as a simple matter of fact. Then she used a term that I will never forget: illegal alien. She used it to describe people who crossed the U.S.-Mexico border illegally. My ten-year-old self didn’t understand why she would use positive sounding words for one group of immigrants but not for the other. 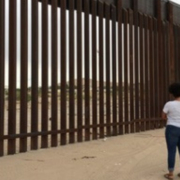 An 18-foot border wall in Sunland Park, New Mexico, built near the end of the Obama Administration. Fast forward to this past summer, to the days leading up to my border awareness trip with the Columban Mission Center in El Paso, as I was trying to figure out how I felt about going. Was I excited? That didn’t quite describe my feelings. I was just ready—ready to start the journey. This would be my first time on the border. I had only seen what it was like through the news and textbooks. I knew that I would be meeting immigrants who had just made it to the United States. While listening to their stories, I expected I would have to hold back tears. I couldn’t have been more wrong. During one of the days, my group was asked to cook a meal for the guests staying at Annunciation House, a local shelter for migrants. We decided to make enough eggplant and chicken parmesan (and watermelon for dessert) for forty people. We chopped vegetables, tenderized chicken, and sliced bread for hours. 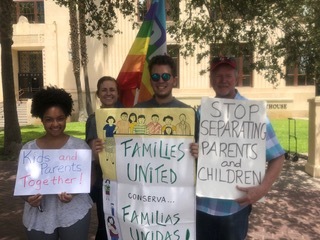 At the El Paso courthouse protesting family separation at the U.S.-Mexico border. Even with my whole group working on this task, I was tired when we finished. But then our guests started to arrive. We greeted everyone in broken Spanish. Once everyone got their food and sat down, I was immediately drawn to a table with children. I love kids, and I have a niece back home who I was missing. Sitting at the table was their mother, a teenage girl, and Jorge, who is the same age as me. I don’t speak much Spanish and they didn’t speak much English. But instead awkward silences I expected, the girls and I ended up making goofy faces at each other. We went back and forth seeing who could cross their eyes and touch their tongue to their nose. They were very good at crossing their eyes! I noticed that one of the girls had the Disney princess Anna on her shirt. I showed them the Disney emoji app on my phone, and then we started imitating all of the silly faces the emojis were making. At the farm workers center in El Paso, learning about the harsh working conditions experienced by farm workers on a daily basis. While the girls were occupied with the Disney app, Fr. Bob (a Columban priest and the Director of the Columban Mission Center) came over to the table and started talking to their mother in Spanish. I tried to listen to their conversation but the youngest girl kept tapping my face so I would pay attention to her. I gladly obliged. We continued to make faces and laugh together until they left to return to Annunciation House. Now it was just me, Fr. Bob, and Jorge at the table. As Fr. Bob and Jorge started talking, he shared with us why he left his home in El Salvador. Jorge is an openly gay man. When he came out to his father, his father disowned him. His father literally removed his last name from Jorge’s name. Without his family anymore, it was just Jorge and his boyfriend. They received death threats and were victims of violence, just for being in a relationship. One of their gay friends was beheaded. So they made the decision to flee together. When they arrived at the U.S. border, they applied for asylum and were put in detention. In the detention center, the other migrants harassed Jorge and his boyfriend. They asked the guards for help but they turned a blind eye. He told us that he had thoughts of taking his own life because of all the pain he’d suffered. After eight months in detention, Jorge was granted asylum. Unfortunately, his boyfriend is still inside. When Jorge told us all this, I asked Fr. Bob to translate for me: “I’m glad you’re still here.” Fr. Bob asked him how is it that he’s able to share his story with such courage and openness. Jorge said that it’s simply by the grace of God, and that whenever he feels like crying he dances instead. Fr. Bob asked him what his favorite type of dance music is (bachata), then put some on. Jorge asked me if I would dance with him. Everyone else from my group joined in the dancing too. Speaking with residents of the neighborhood of Duranguito about their efforts to combat neighborhood destruction to build a brand new baseball stadium. As an advocate, it’s easy for me to get caught up in the process of passing bills or organizing rallies in order to make a systemic change. But being immersed in a border community like El Paso and forming relationships with individuals made me realize that I can forget about how there are people who need help right now. Though I like to focus my energies on working for social justice, during my time at the border I was able to focus on charitable works. I met a lot of people there who weren’t as focused on systemic change as I am. They just want to be looked at as a human being, to have somewhere to eat and sleep. El Paso opened my eyes to the importance of balance, that social justice and charitable works go together. Many people call this the “two feet of love in action.” So my goal for this fall semester back in Omaha is to make sure I’m walking with two feet, not one. 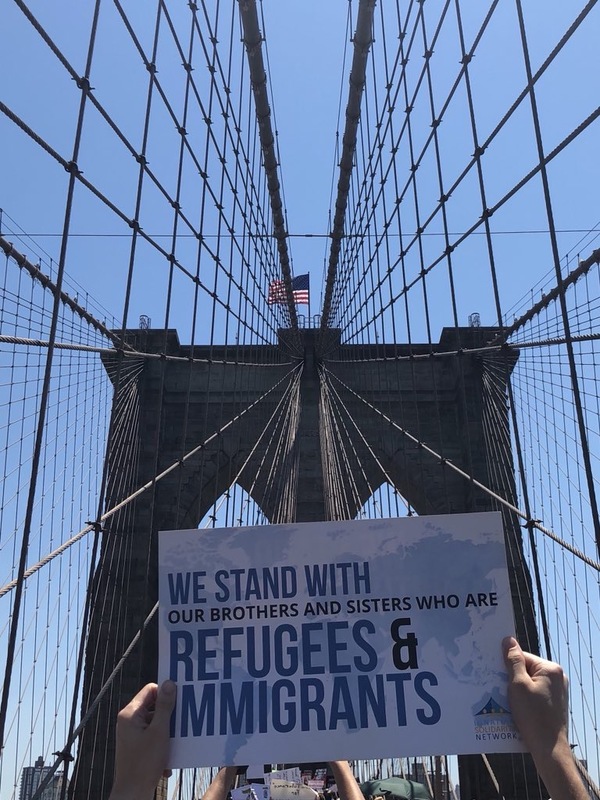 To learn more about the border and how you can stand in solidarity with your sisters and brothers who live there, consider signing up to receive a free copy of the Columban Center’s “Border Solidarity Toolkit.” It includes a number of activities for prayer, education, and action then can help you walk with both feet of love. 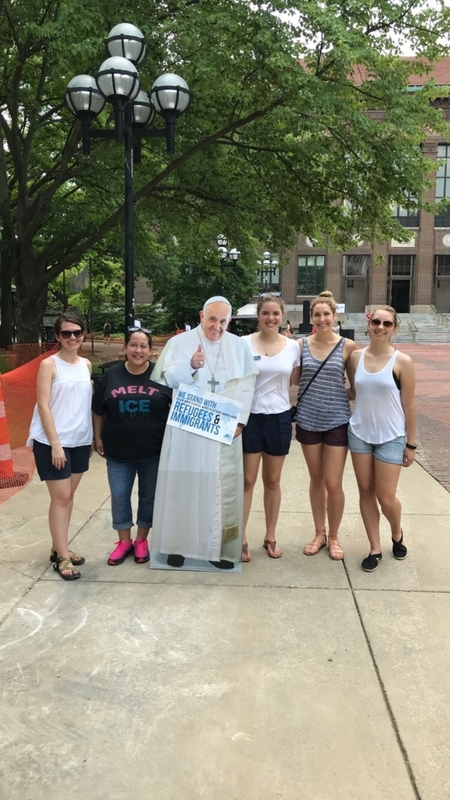 Lizzie Hudson was the Environmental Justice Intern for the Columban Center for Advocacy and Outreach in the summer of 2018. She attends Creighton University, where she is studying sociology and philosophy. After graduation, Lizzie plans to go into advocacy full time—hopefully in the realms of racial justice, immigration, environmental justice or somehow a mixture of all three! 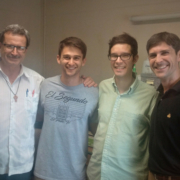 This summer, three Jesuits in formation arrived in El Paso at an unexpectedly crucial time. From July 17-26, Nazareth Shelter, one of several church-based, all-volunteer temporary shelters coordinated by Annunciation House, a forty-year-old organization committed to serving recent arrivals at the U.S.-Mexico border, took on a temporary mission—receiving reunited parents and children who had been separated by the Trump Administration’s “zero-tolerance” policy. 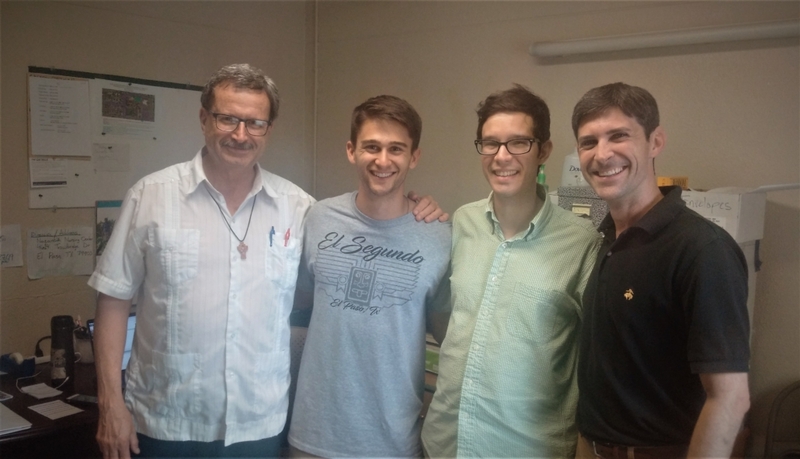 Rafael Garcia, S.J., associate pastor at Sacred Heart, the Jesuit parish in El Paso, with Conan Rainwater, S.J., Matt Cortese, S.J., and Matthew Baugh, S.J. Conan Rainwater, S.J. (Jesuits Midwest Province), who served as temporary shelter director, coordinating volunteer shifts and meal groups, among other logistics, was joined by Matthew Baugh, S.J. (Jesuits Central and Southern Province) and Matt Cortese, S.J. (Jesuits Northeast Province). They joined an extensive network of volunteers tasked with providing food, shelter, and basic material needs, in addition to helping families connect with family members in the U.S., coordinating travel plans, and providing transportation and accompaniment into the airport or bus station for families who were dropped off unannounced through the day and nighttime hours. A reunified father and his nine-year-old daughter at Nazareth Shelter. The two were separated for 2 months, during which time she had a birthday. While in detention, he painted a birthday card for her. He gave her the painting on the day of reunification. “Rather than coming in [to shelters] all at one time in a bus or two, as is the typical case for parents and minor children who are processed and released with ankle bracelets on the parents, the families came in small numbers in vans throughout the day and night,” shared Rafael Garcia, S.J., who serves migrant and refugee persons and is Associate Pastor at Sacred Heart, a Jesuit parish in El Paso, which is a member of the Campaign for Hospitality. Washington, D.C.’s June 30 rally featured Lin-Manuel Miranda, award-winning musical composer, who performed Dear Theodosia, a song from his musical “Hamilton” about parents building a better world for their children. When interviewed, Miranda said, “We will not stand for a country separating children from their families. 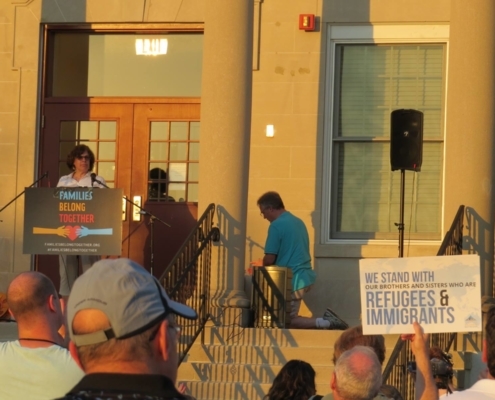 And if you are silent on that issue, or are somehow for that issue you’re not getting re-elected.” Parishioners from Holy Trinity Catholic Church were in attendance at the rally. 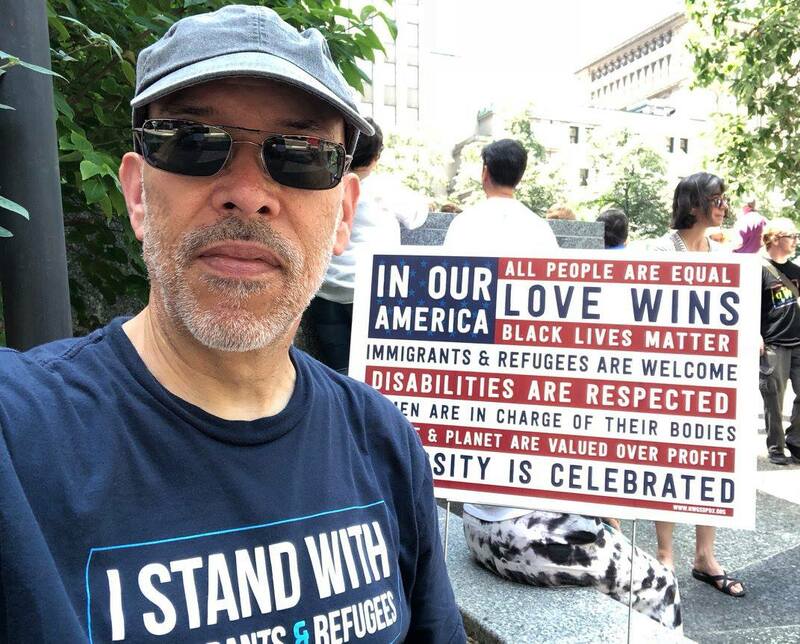 Henry Gonzalez, Christian Life Community member, at the Pittsburgh rally. 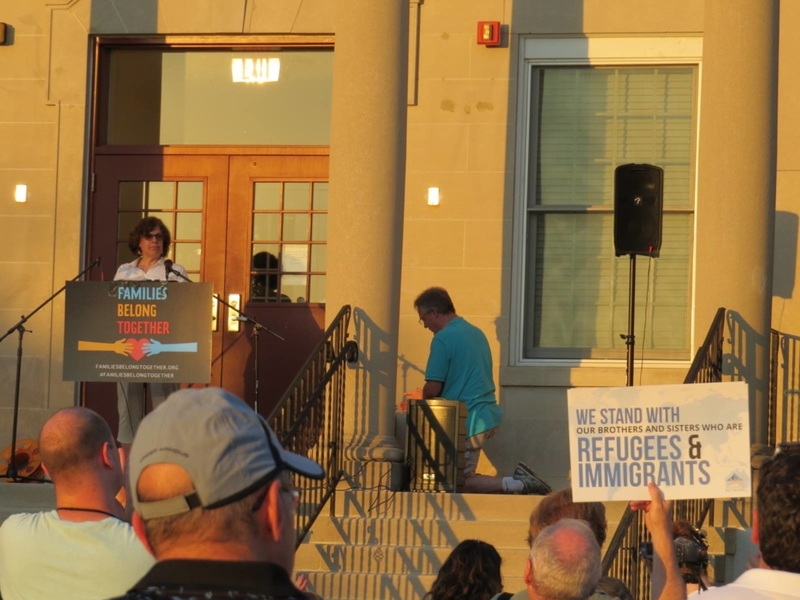 Stephanie Murray, event organizer for the Pittsburgh rally, spoke about the President’s executive order ending family separation. “It’s a band-aid that isn’t even very sticky. It’s an off-brand band-aid. It’s for show more than anything.” Pittsburgh is a city in which some separated children are being housed. In Ann Arbor, Irene Butter, Holocaust survivor and professor emerita at the University of Michigan’s School of Public Health, spoke at the city’s protest and rally. “It was more than 70 years ago that I was separated from my family, and I have never forgotten the pain, the anxiety and the fear that was associated with this separation,” Butter said. “Now knowing that hundreds of children—hundreds of vulnerable children—are subjected to this extreme trauma is totally devastating and heartbreaking for me. We are here today because we all have a social conscience and recognize that all of us are responsible for each other. We cannot be bystanders,” she continued. 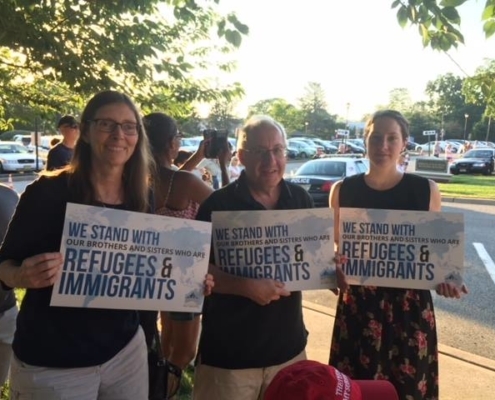 Democratic U.S. Representative Debbie Dingell (MI-12) also spoke at the Ann Arbor rally, and expressed a promise to continue pressing the Administration and Congress to reunite the separated children. Families Belong Together rally in Cleveland, Ohio. 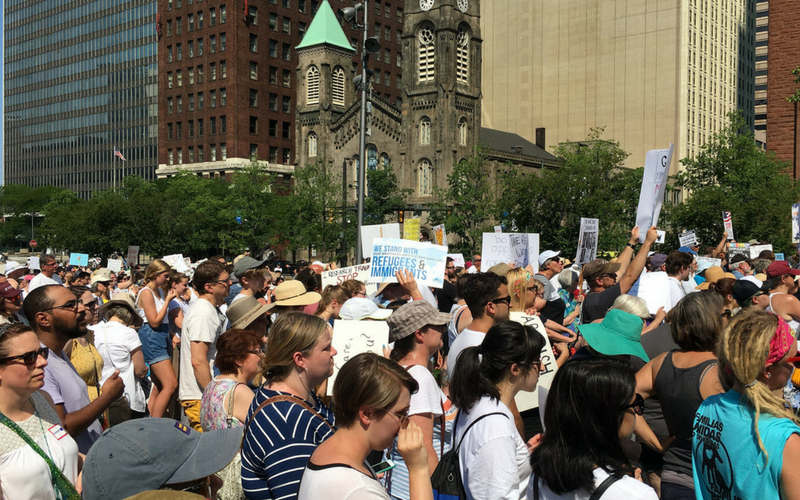 Cleveland’s rally included stories shared by undocumented immigrants and speeches by immigration attorneys and political and religious leaders. 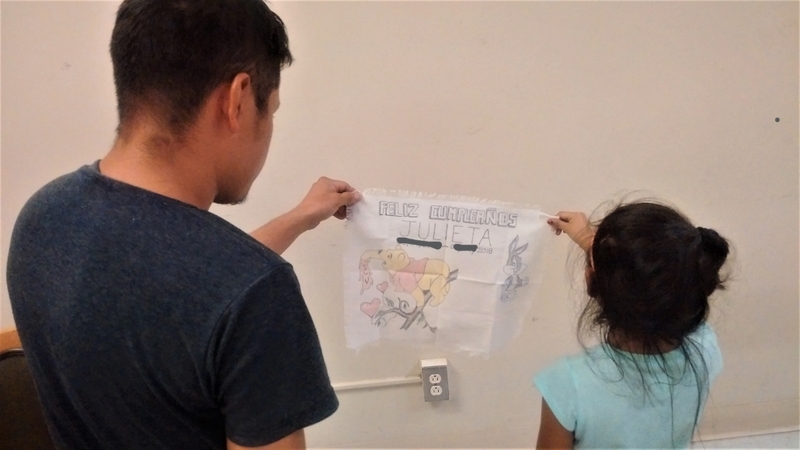 The issue of family separation recently hits close to home for Ohioans given the increasing prevalence of ICE raids in Ohio communities that have led to the separation of families. Los Angeles mayor Eric Garcetti spoke at the city’s rally, saying, “if you are pro-family, you cannot separate families,” and encouraging the Administration to care about this issue as much as his constituents do. 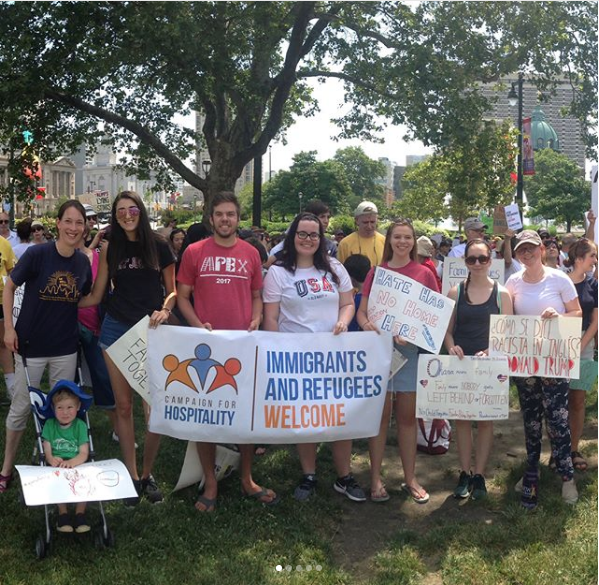 Many families attended the Families Belong Together rally in Philadelphia. Several noted that their dedication to this issue stems from their love for their own families and empathy for those who have been forcibly taken from theirs. 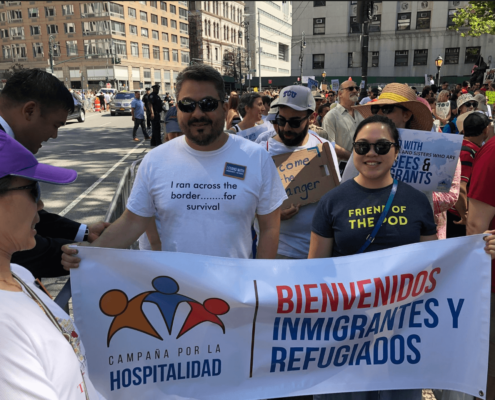 Other attendees noted that they hope to catch the attention of not only the Administration by rallying, but also of their local elected officials so that they too can be held accountable for their political decisions that affect migrants. 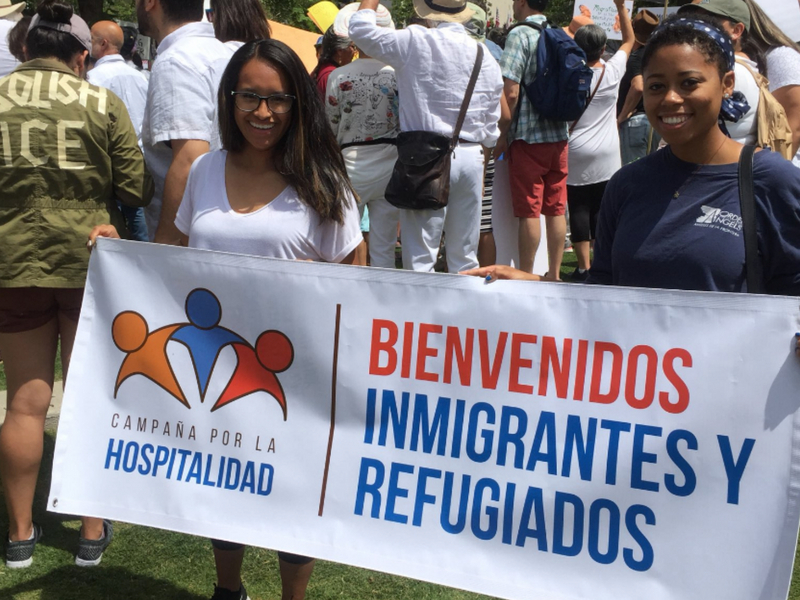 Joining many other cities in the conservative border state of Texas, Austin held a rally at the Capitol building to pressure the state’s congresspeople to respect the dignity of those seeking opportunity in their respective locales. 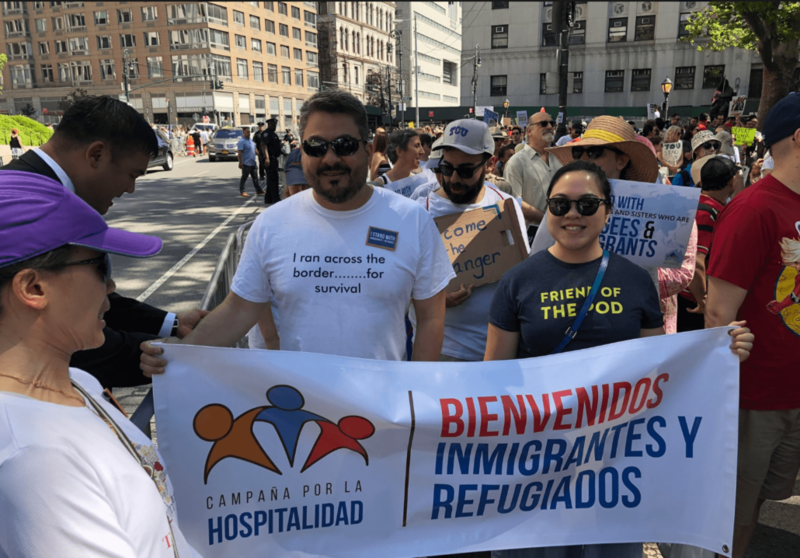 Leaders of local organizations shared personal stories of working with migrants and witnessing the struggles they have gone through to move to the United States, urging the government to stop engaging in brutality and human rights violations. Editor’s Note: This is not an exhaustive list of Ignatian network-attended events. At six and a half years old, Roberto* enrolled in kindergarten, a year behind his peers. Over the last 8 months, when he ought to have been learning to read and playing on the playground, he had instead been on the run with his papa, mama, and four year old sister, Marian—from the gangs in his home nation of El Salvador, from the human traffickers on the Guatemala-Mexico border, from the paid contractors on the Mexico-U.S. border looking to capture him and return him to the violence he had fled from months prior. He, like so many in similar situations, has experienced trauma. 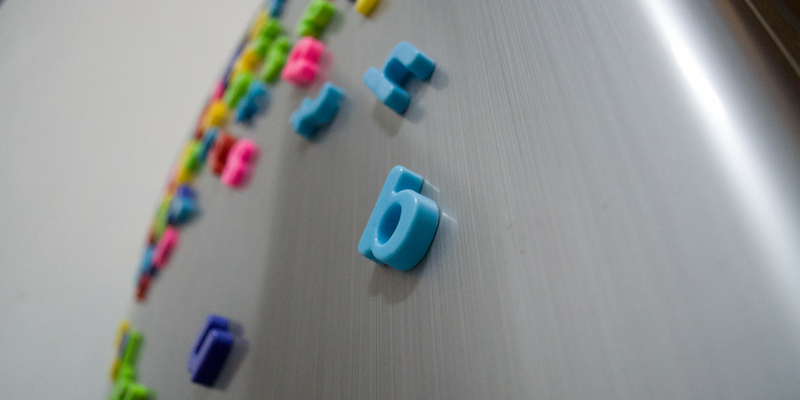 His first day in Cincinnati, Ohio, he spelled mama ven, mama come, on the refrigerator in magnets. Stretching his spelling skills across time and space, begging for safety and security for his family. But it would be more than four weeks before ICE would release her and 4-year-old Marian to our care. Mama with an ankle monitor and Marian barely recovered from the chicken pox she caught while incarcerated in the euphemistically named “South Texas Family Residential Center,” a prison in all but name, where they had to prove “credible fear” before a hostile ICE officer. After a night spent in the airport, they finally arrive—a tearful reunion—holy. On Good Friday, the many faces of Christ crucified today covered the cross during veneration at Bellarmine Chapel in Cincinnati. So here we are in 2018: Our government actively separating families like theirs for the sole purpose of discouraging other immigrants from coming, from fleeing violence in search of a better life. Here we are: okay with locking up a 4-year-old child and her mother in an isolation ward, a shared solitary confinement; okay with a child sleeping on a tax-payer funded slab of a cot in a dark room without electricity. Okay with so many families fleeing death threats for the better part of a year, only to be locked up by the designated “safe” country like they had committed a crime rather than been the victims of one. We, the American people, have decided we are okay with this—so long as we’re secure. But we, the Catholic Church, have decided we’re not okay with this. 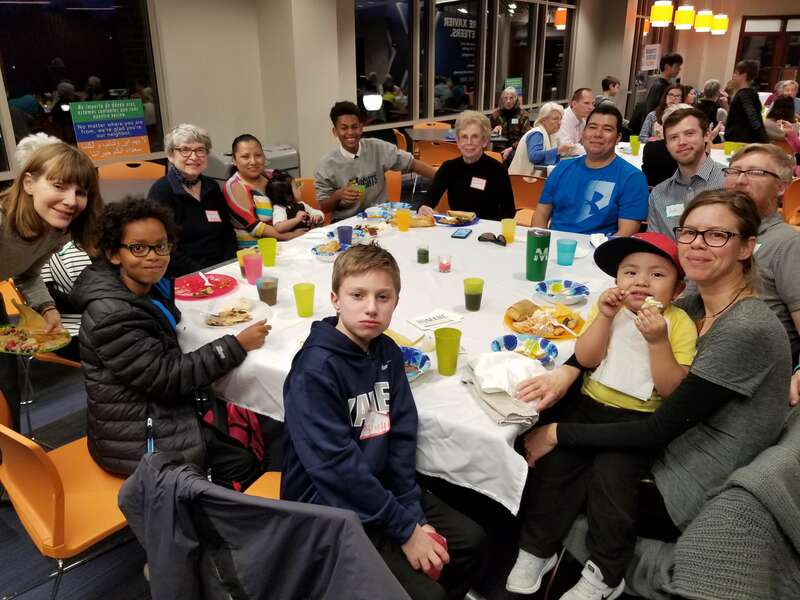 Bellarmine parishioners and members of the local immigrant community from Guatemala, Honduras, and El Salvador participate in a Share the Journey potluck meal. Last fall, Pope Francis invited all Catholic congregations across the world to join him in doing precisely this, launching a two-year campaign with Caritas called Share the Journey. 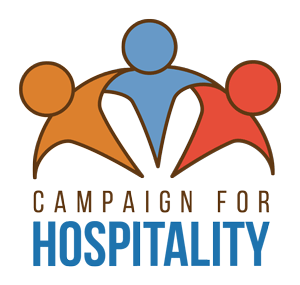 In partnership with the Jesuits, the Ignatian Solidarity Network has launched a complementary effort known as the Campaign for Hospitality, with roots going back to an intercontinental Jesuit social ministry conference in the Dominican Republic last year. Among the attendees at that conference was Fr. Dan Hartnett, S.J., a longtime missionary in Peru and the current pastor of Bellarmine Chapel on the campus of Xavier University in Cincinnati, Ohio. He returned from the conference on fire, quickly convening a group of parishioners and staff, including this author, a licensed social worker—around a simple question—What can we do? He wondered how we might begin to change the narrative around immigrants in our nation, or at least our community, to move from a story of criminalization to one of humanization. 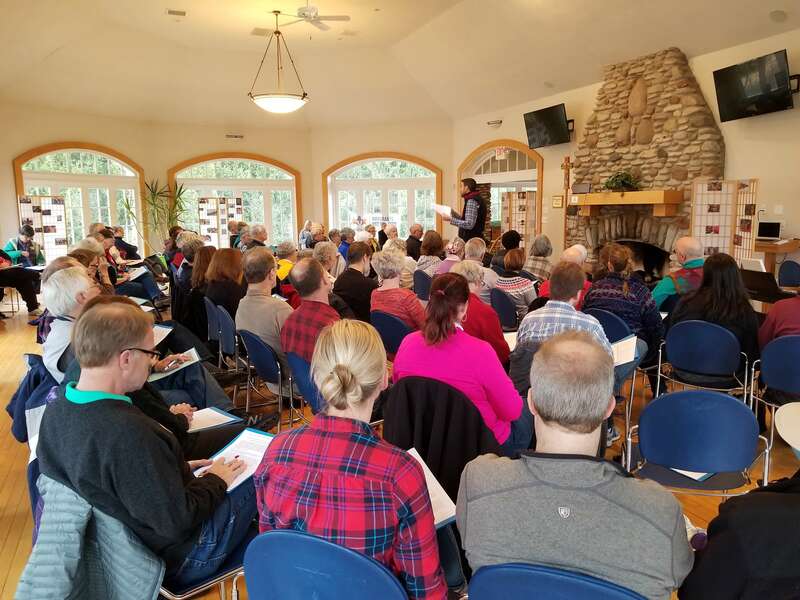 At Bellarmine’s Share the Journey retreat for parishioners, Xavier University Theology faculty, Dr. Marcus Mescher, provides Biblical grounding for welcoming the stranger. As one parishioner remarked, “We can’t continue to treat trauma survivors like criminals, to treat preschoolers like enemies of the state. If we throw people away, label them disposable, the excluded of the earth, we spit in the face of God. 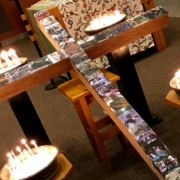 Jesus reached out to the most vulnerable, and said, I love you—let us eat together, let us have table fellowship.” Bellarmine’s table has grown, and we’ve gotten an inkling of the table size Jesus imagined, that God crafted to feed us all. A member of Bellarmine’s Immigration Team welcomes attendees to a screening of the documentary Human Flow. 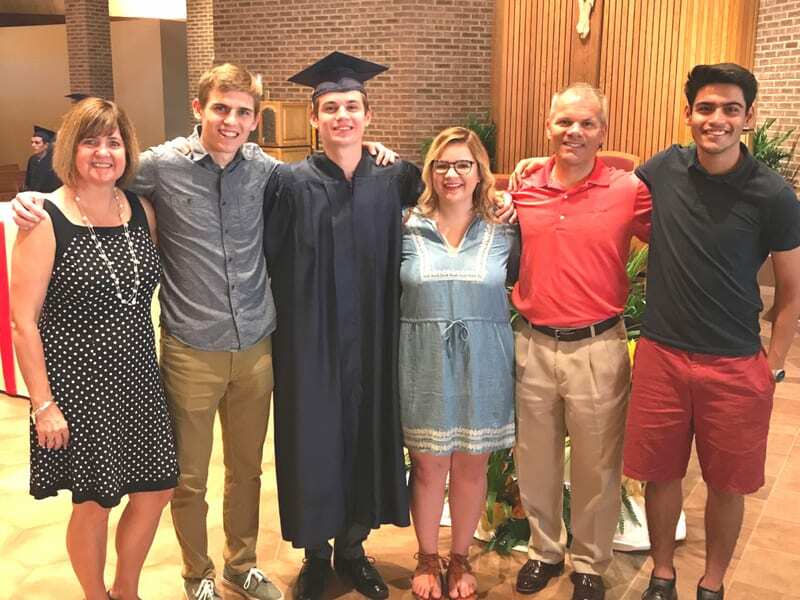 From that initial gathering, we have rapidly expanded encounters between our primarily white, university-bound, middle and upper-middle class parish with our immigrant neighbors. 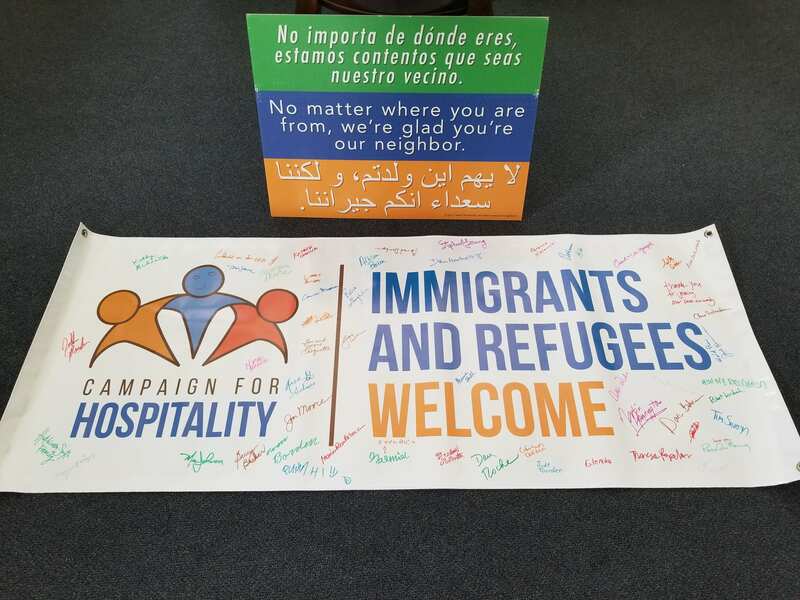 We have formed a parish Immigration Team that meets on a monthly basis and has sponsored a number of events in the realms of 1) Hospitality/Relationship Building; 2) Education; and 3) Advocacy. We’ve held a story-sharing event with 250 in attendance, listening to immigrant women and Dreamers share their trauma and triumphs. We’ve accompanied five women and their families as they have launched a catering business—with their first event our Feast of St. Ignatius Picnic for over 200 parishioners with fresh tamales, empanadas, and papusas—and much fellowship. We held a Share the Journey retreat with 100 parish leaders present. We’ve helped launch a new nonprofit in the city, Casa de Paz/House of Peace for Latina survivors of domestic violence. 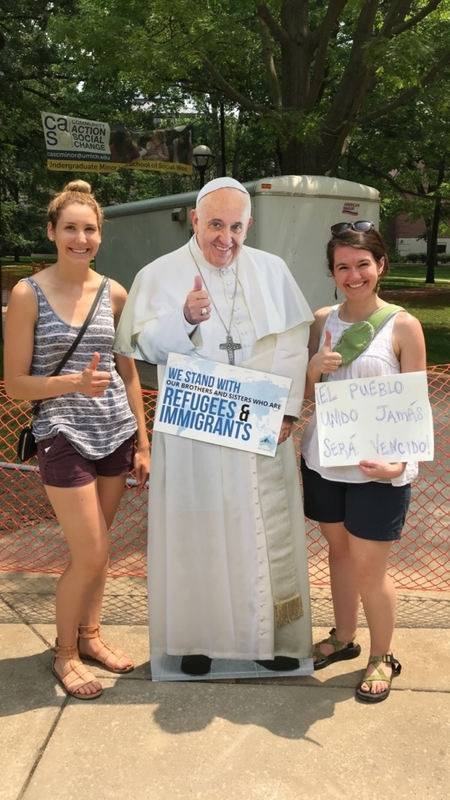 And we’ve recently helped the Ignatian Solidarity Network establish an Ohio-wide coalition of Jesuit works lobbying Senator Portman on the Dream Act. But perhaps our deepest encounter, the one where we’ve truly shared the journey, expressing hospitality in the most radical sense of the word, of actually identifying with the suffering and becoming vulnerable ourselves in the process, has been with Roberto, Marian, Ella, and Luis, the family of four from El Salvador. We met them through the Kino Border Initiative, a Jesuit project in Nogales, AZ. KBI had contacted Bellarmine some months earlier with a simple request: We’ve got a family coming from El Salvador, could your parish take them in? Father Dan wanted to do this, but he knew he couldn’t do it alone—his time in Peru meant he had a command of the language, but that wouldn’t be enough to carry a family from suffering to safety. Could our community move beyond the protected pavers and well-manicured lawns of Xavier University, beyond our own class privilege and white skin, towards true encounter? An informal survey of the parish, 750 households in total, revealed a smattering of Spanish-speakers, no more than 10 families. Was that enough? Could we make this work? Father Dan stood before the parish one Sunday, and directly said: “Bellarmine, we’ve been asked, can we respond? We’ve been called, how will we answer?” He put the question before each of us—and the response was tremendous, sacred, blessed. Having gone through the Spiritual Exercises as a community, we were primed for discernment and ready for real encounter. We wanted to be a field hospital like Pope Francis urges, a church abounding in mercy and love. Within weeks, we received an outpouring of generosity. Solidly ¼ of the parish actively relayed a desire to be involved, to support financially, assist with medical or legal counsel, educate, provide meals, and more. When a bilingual family stepped up to host in their own home, we knew we were moving with God. In Fr. Dan’s five years with the parish, it was the greatest single activation he’d seen. And so we said yes: yes to God’s call, and yes to accompanying our migrant neighbors through trauma to health. It has been a lot of work to support this family’s transition, and we’re still early in the process (pray for us! ), but we are as far as we are because we made a conscious effort to work together in a move from the culture of indifference towards the culture of encounter, towards radical hospitality. When we strive to make ourselves vulnerable, God abides. When we strive to become painfully aware, and our fortresses begin to break down, we become something better than we were before conversion. When we hear our neighbors’ heartbeats’ distress in our own chests, and realize the blood they spill is our own blood, the abuse they endure is, in some part, our own—we can no longer turn a blind eye to their suffering. When this happens, we know in our depths that the Body of Christ is real, and everything is connected in God, shining like the sun. When this happens, we know the tears of a child are the tears of our own children, crying out mama ven, mama come—the call of God. And we do our best to respond, to surround them with the same love we do our own. I am glad our church is one of thousands across the nation trying to live out this call to love, striving to Share the Journey. My brother Zachary was never the most athletic player on the field. In fact, for a decent portion of his childhood, he appeared as the exact opposite. Zach was the first kid to get glasses in elementary school, contracted asthma at a young age, and had allergies so extensive that, at age nine, he endured a series of painful shots once a week to combat his sensitivities to the environment. He looked like a blonde Harry Potter with a red ring around his mouth due to habitually licking his lips. Nevertheless, Zach got contacts, overcame asthma and his allergies, started using chapstick, and became a pretty talented soccer player. But, Zach’s best friend Jhony? Jhony was always picked first for the team. Jhony entered our lives in 2007 when he and Zach started playing soccer together. They were both in the sixth grade. As a pre-teen, Jhony was lightning fast and had foot skills that made all coaches in the league salivate. In any game, you could hear parents guffaw at his finesse. And as he grew up, he only got better. He was one of two freshmen to make the varsity soccer team at our high school. He was also a varsity track star. The cross country team wanted him to quit soccer in favor of their sport. He didn’t. His heart was with the beautiful game. 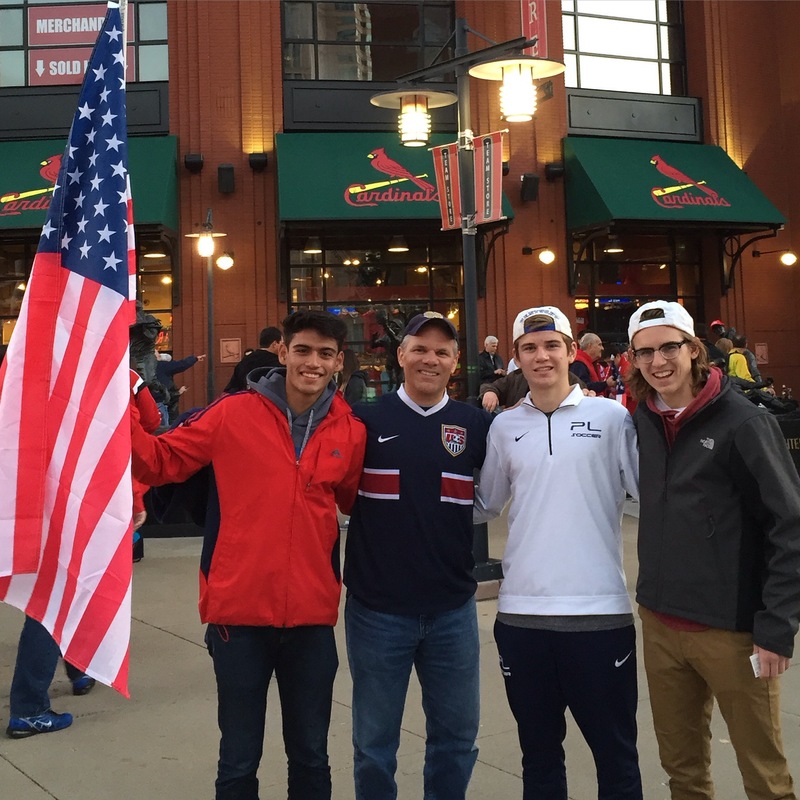 Jhony with the author’s father and brothers at a World Cup qualifier game. Even with all of the fawning and praise, Jhony remained humble, hardworking, and unbelievably kind. 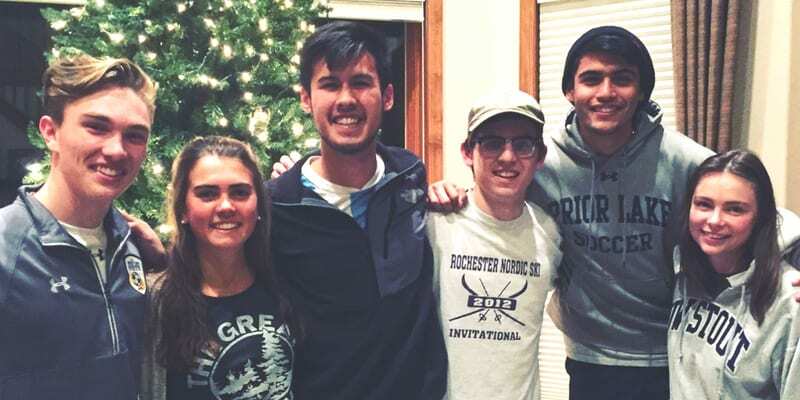 He, Zach, and the rest of their club soccer team played together for years and grew to become best friends. They were known around the town, too, as a group of boys you could rely on. Together, they worked on school projects, coached younger players at camps over the summer, and went to church functions at our local parish. They ate dozens of Chipotle burritos, explored abandoned buildings they thought were haunted, and drove around our small Minnesota town in used cars. When people say “boys will be boys,” I can only hope they mean the kind of boys that comprised the group my brother and Jhony were a part of. Jhony and Zach with friends. And even after they left high school, the friends remained close. So did their families. In 2015, Jhony asked my dad to be his RCIA sponsor. 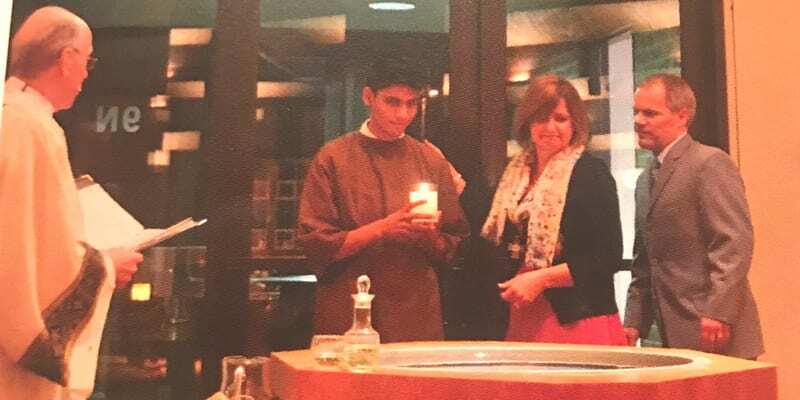 Upon Jhony’s confirmation at the Easter Vigil, my parents became Jhony’s godparents, solidifying his status as not just a friend of Zach’s, but a member of our family. Jhony and the author’s parents (his Godparents) at the Easter Vigil Mass celebrating Jhony’s initiation into the Catholic Church. Since the day I met his family, I knew the lives of Jhony, his mom, his dad, and his younger brother were inherently different from my own, even if I wanted to convince myself that we were the same. Back then, in 2007, I didn’t know what it meant to celebrate what made humans different from one another. I thought it was better to pretend everyone was a fake kind of equal, that it was better to assimilate. For fear of appearing offensive or ignorant, I felt embarrassed and refused when my mom asked me to speak Spanish with Jhony’s mom in the bleachers at the soccer games. The first couple of times Jhony and his brother, who was the same age as my youngest brother, came to my house, I avoided asking about their cultural identities because I thought it was rude. But in this manner, I never knew anything. Fortunately, as I grew older, I became privy to the beauty in cultural awareness and understanding. And gradually, the family I had known for nearly half of my life became even more familiar to me, as if a flower I did not properly water finally began to bloom. They never closed themselves off from me—I secluded myself from them. This is why I never knew the details of their residence in the United States, the details of how and why they moved from a country stricken by war, poverty, violence, and natural disaster. The reasons they left El Salvador. The author’s father with Jhony and his mom, Juana, at his confirmation. 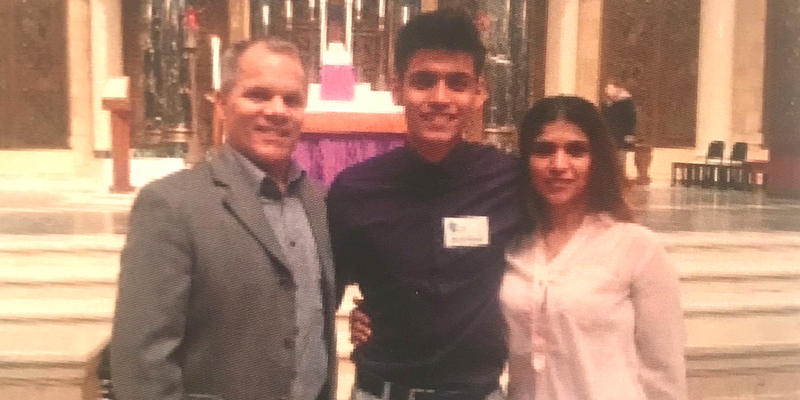 Jhony and his parents are recipients of Temporary Protected Status, or TPS—a form of relief provided to residents of certain countries designated by the United States. Typically, these are countries that have faced significant natural disasters, have ongoing armed conflicts, or meet other extraordinary circumstances. When Jhony was a young boy, his parents left a damaged and ransacked El Salvador in search of safety and security. Under TPS, they were able to enter and live legally in the United States. They have resided in Minnesota for nearly twenty years. Jhony has never known a home outside of the United States. He has never traveled to El Salvador since fleeing in his early childhood. Essentially, he is an American. He is just as American as me, my brothers, or any person I know. And now, he must leave. Not because he wants to but because he has to. On Monday, January 8, 2018, President Donald J. Trump and his administration announced the decision to rescind TPS for the people of El Salvador. Jhony, his parents, and over 200,000 people receiving TPS from El Salvador will be forced to leave the United States by September 9, 2019. There are no direct pathways to citizenship or permanent residency for TPS recipients, regardless of their legal entry and residence. There are no options. Jhony, his family, and over 200,000 other Salvadorans present in the United States under TPS will face deportation away from a place where they were once welcomed, from a place they were given relief, from a place that has become their home. And they will be deported to El Salvador, a nation very much unprepared for the influx of people, and a country where young men like Jhony could, quite likely, die. I don’t wish to enforce the commentary of our president that El Salvador and other countries designated for TPS are “sh*thole countries.” Clearly, El Salvador has and continues to offer enormous amounts of beauty; in its people, its culture, its landscapes. But the poverty, oppression, and violence remain, and must not be overlooked. The injustices are rampant. 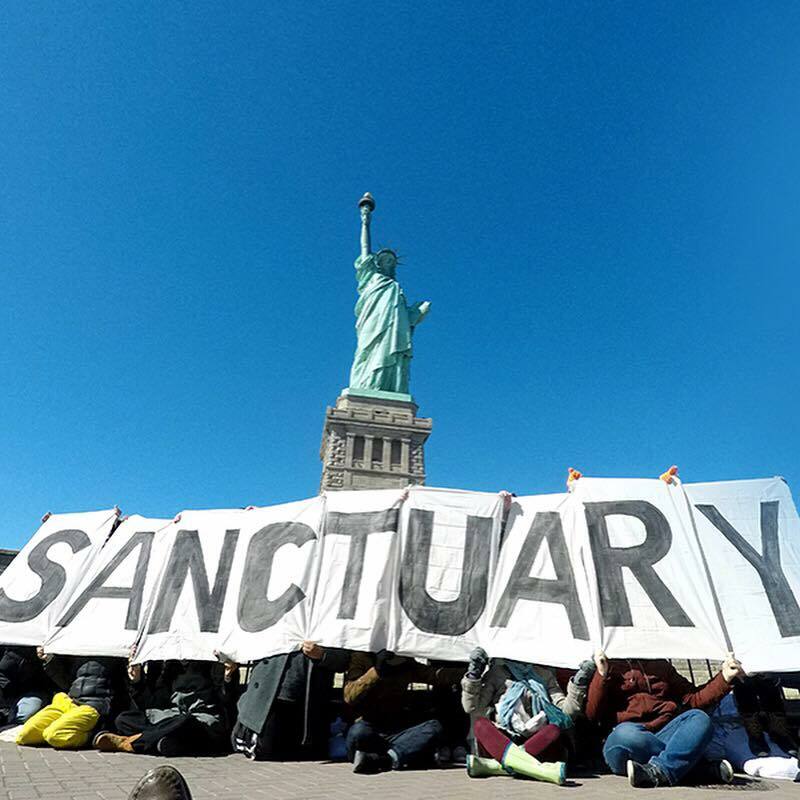 Temporary Protected Status for people of El Salvador only guaranteed what the very title intended: temporary protected status. Since 2001, Salvadorans have lived in the country under the guise that they would be safe. For 17 years, Salvadorans learned, worked, raised children, laid roots, and, eventually, fell in love with the people, culture, and landscapes of a new place: the United States of America. The U.S. took in the migrants and gave them not only a shelter, but a home. But now, we’re returning the tired, poor, and weary. They are no longer welcome. There’s no longer room at the inn. The author’s family and Jhony. My family and I have always been people who feel we can find a solution to any problem. We can come up with an answer, we can work something out. 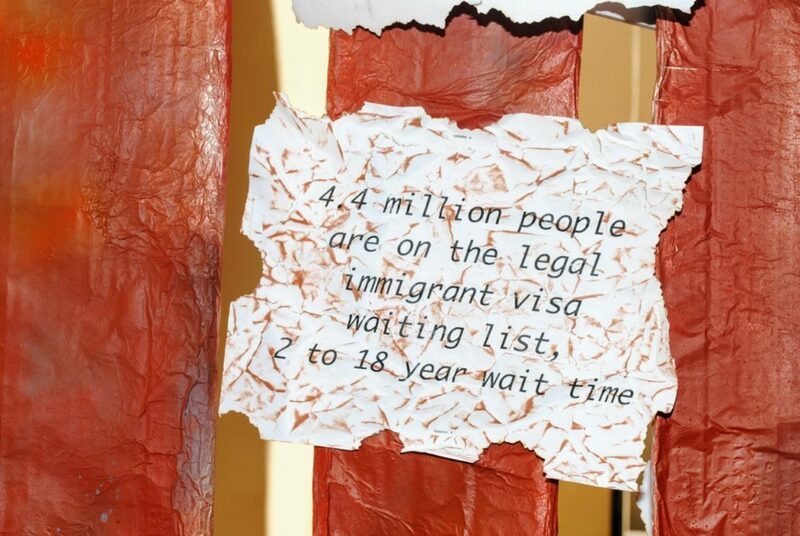 I especially feel a responsibility now, as a Jesuit Volunteer, because I work in migration legal services. I have the knowledge, I have the resources. But this…I can do nothing but shrug my shoulders and shake my head. “I’m sorry, Mom and Dad. I’m sorry, Zach. I’m sorry, Jhony. I’m not sure there’s anything we can do.” I’ve never felt this sort of helplessness. I can only imagine how migrants must feel. This story was originally published as part of the Ignatian Solidarity Network’s #JVReflects series, which explores the intersection of faith and justice from the perspective of JESUIT VOLUNTEERS serving as long-term volunteers both domestically and internationally with Jesuit Volunteer Corps and Jesuit Volunteer Corps Northwest. Reflections specifically focus on the cornerstone values of the Jesuit volunteer experience: spirituality, simple living, community, and social justice. In the heart of El Paso’s Segundo Barrio neighborhood, at the edge of the United States – Mexico border, Sacred Heart Parish is a source of help and hope for its community. A Jesuit parish since its founding 125 years ago, Sacred Heart, or Parroquia Sagrado Corazón, is more than a religious home; it also provides programs for the immigrant community, a food bank and a weekend food service and catering project. 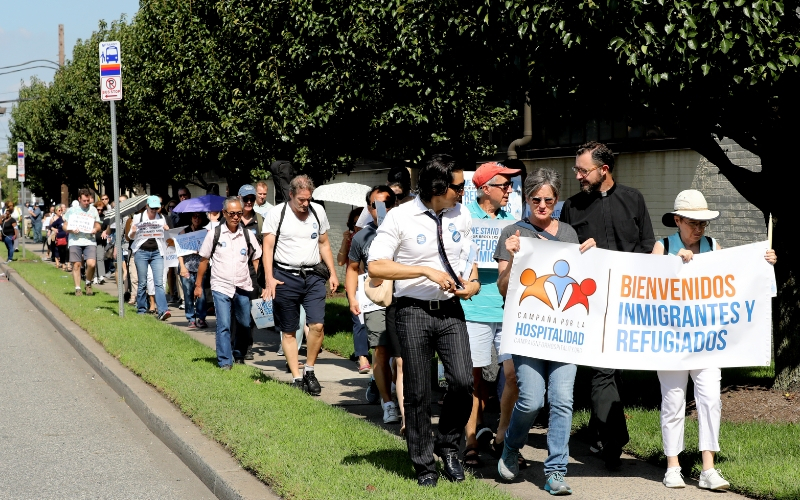 This March, it was a focal point for a border immersion experience, welcoming 18 Jesuit partners in mission who came to learn more about immigration and the experiences of people who seek to start new lives in the United States. The entrance to Sacred Heart’s pastoral center, in the busy Segundo Barrio, El Paso, Texas. Father Rafael García, SJ, associate pastor of Sacred Heart Parish, and Mary Baudouin, USA Central and Southern Province’s provincial assistant for social ministry, organized and led the border immersion in El Paso and Ciudad Juárez, Mexico, March 15-18. 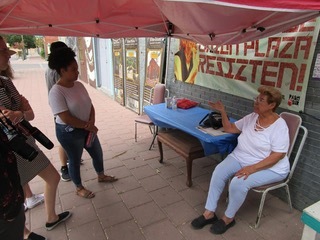 The trip included four full days of opportunities to hear diverse perspectives about immigration, encounter migrants who have come to the United States seeking asylum, safety, and stability and learn about some of the organizations migrants encounter. Jesuit partners in mission “immersed” themselves in a border experience in El Paso, Texas and Ciudad Juárez, Mexico. Immersion trip participants traveled to El Paso from all over the Jesuits USA Central and Southern Province and beyond. Some were members of Jesuit parishes in Kansas City, Mo. ; New Orleans, Saint Louis and San Antonio, Texas. 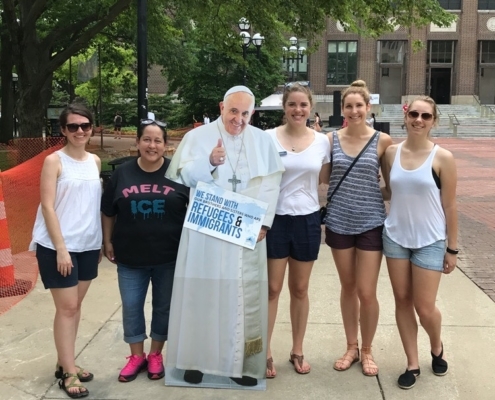 Other participants are employees of Jesuit apostolates, including the Ignatian Solidarity Network, Loyola University New Orleans, and Jesuit Volunteer Corps. Two Jesuit novices who are ministering in El Paso also joined the group. Participants’ ages ranged from 22 to 81, establishing a foundation for rich, intergenerational dialogue and reflection. The convent of the Sisters of St. Joseph, where the group stayed, provided a welcoming and reflective space to unpack each day. The Spanish word for “encounter” – encuentro – translates more precisely to “discovery.” Indeed, immersion participants related that their experiences on the trip revealed the deeper aspect of the word, as they not only encountered new facts and ideas, but also felt authentic connections, kindled by meeting people where they were on their journey. A participant chats with a young girl across the border fence at Anapra. While visiting the border wall between El Paso and Ciudad Juárez, participants met with a Border Patrol agent who discussed his work. 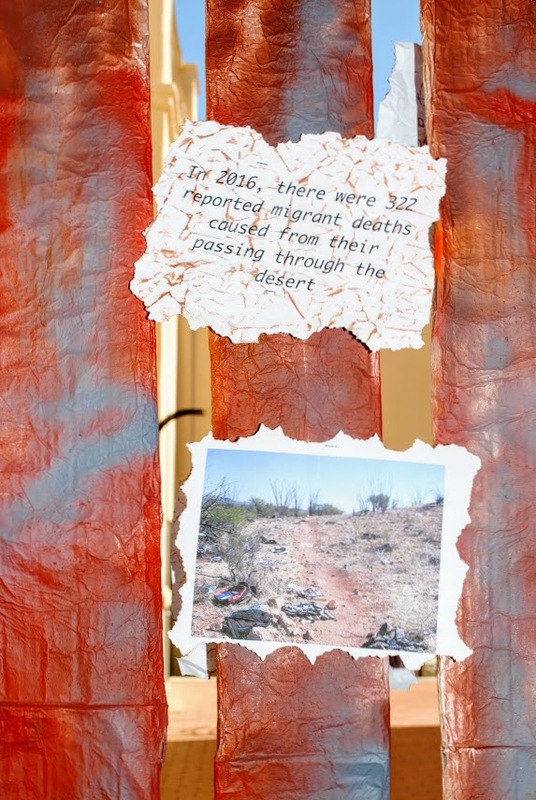 His was the first of many varied points of view on migration that the visitors would hear. Members of the group also visited El Paso nonprofits like Diocesan Migrant and Refugee Services and Manos Amigas, each of which provides important services to immigrants and refugees, from safe shelter to legal assistance. Anna Hey of Diocesan Migrant and Refugee Services, Dylan Corbett of Hope Border Institute, and Ruben Garcia of Annunciation House, each offered their expertise and knowledge to aid the visitors in understanding the complexity and challenges of the U.S. immigration system. Hey, an attorney, presented on the challenges and myths about the immigration system, noting that in El Paso, only about 2% of applicants are granted asylum, compared to the national average of 50%. “Seeking asylum is not a crime, and denial in an asylum case can be a death sentence” when people are fleeing violence, threats, extortion, political instability and extreme poverty, Hey noted. Beauty and poverty co-exist in Ciudad Juárez, Mexico. Across the border in Anapra, one of several impoverished neighborhoods in Juárez, the group toured a construction site where nearly 40 young volunteers from the community were helping to build sustainable, low-cost houses, and visited a parish, a nonprofit and a support group for impoverished women with cancer. Members of the support group, housed at Centro Mujeres Tonantzin, shared their testimonies and experiences with the health care system. The system, they said, looks great on paper, but fails to meet the needs of those on the margins. Citing one example of unforeseen challenges, the women explained that chemotherapy can only be received in the capital city four hours away. That requires the sick woman to arrange for child care, then pay the $70 bus fare just to make it to the treatment center. If they also have to pay for lodging, it can become an insurmountable burden for women in rural areas. This is one of the many “problems that come from being a poor woman with cancer,” said one member of the support group. A woman describes the challenges of “being a poor woman with cancer” navigating a broken healthcare system. While in Anapra, the group also visited the Kansas City organization Manos Amigas, which supports ministry to students and the elderly, and has been accompanying this community for over 25 years. One beautiful and challenging encounter was a visit to the El Paso U.S. Immigration and Customs Enforcement (ICE) detention center where migrants are held while they await trial. Father Garcia regularly provides pastoral care there. Father García and Fr. 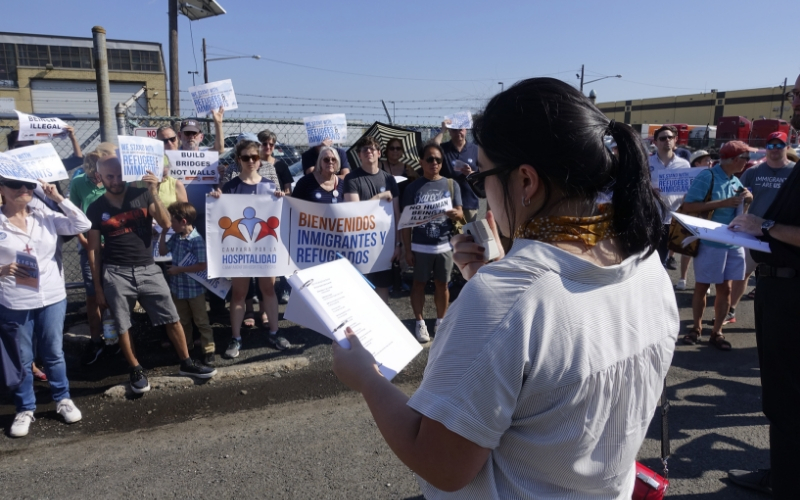 Eddie Gros, pastor of Holy Name Parish, New Orleans, concelebrated two masses for detainees. 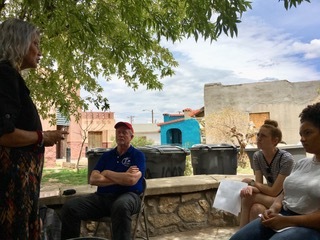 Participants also learned about the many ways in which the combined community of El Paso and Ciudad Juárez accompanies those who are affected by the issues and challenges of life on the border. The two cities, nestled together, divided only by a border, are forever encountering each other. Many people live as if there is no border and see El Paso and Ciudad Juárez as one community that will not be isolated by a border. 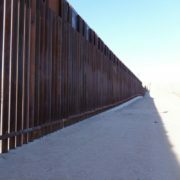 In some areas, like Anapra, that border is an 18-foot steel fence, and in others, it is a natural boundary such as a river. From the convent’s porch, El Paso and Ciudad Juárez are indistinguishable–the red ‘X’ sculpture is just across the border. Ruben Garcia, director of Annunciation House, a hospitality home for migrants, said, “The world will no longer allow us to live in isolation.” It is imperative, Garcia urged, that U.S. citizens come to see the nation’s “intimate relationship” with migrants, many of whom are fleeing their home countries for reasons not unconnected to American foreign policy, the drug trade and a low standard of living. The group had ample time to reflect on their experiences, the moments of challenge, confusion, discomfort and joy throughout the trip, and the pull to be more radically welcoming to all God’s people. Father García and Mary Baudouin hope this immersion will be the first of many opportunities to experience encuentro at the border. At the end of their stay, the group was invited to question: What am I being called to do in response to what I have seen? What can I do to continue to learn about borders in my community? Fr. Rafael García, SJ, thanks immersion participants after the congregation blessed and sent them forth during Mass at Sacred Heart Parish in El Paso. The border immersion experience was a collaboration between the USA Central and Southern Province and the Jesuit Social Research Institute (JSRI). JSRI, which this year celebrates its tenth anniversary, is itself a collaboration between the UCS Province and Loyola University New Orleans. Based at the university, JSRI seeks to educate and advocate on issues of race, poverty, and migration. 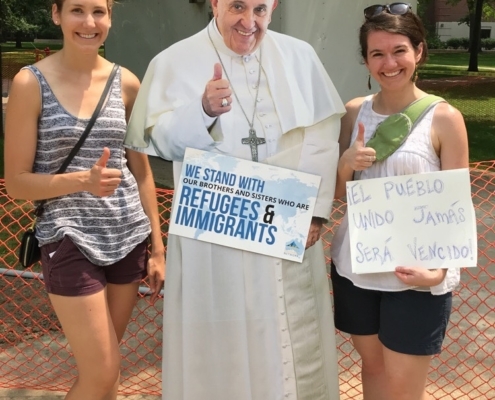 Father García, who ministers to immigrants and refugees in El Paso, is also an associate of JSRI. 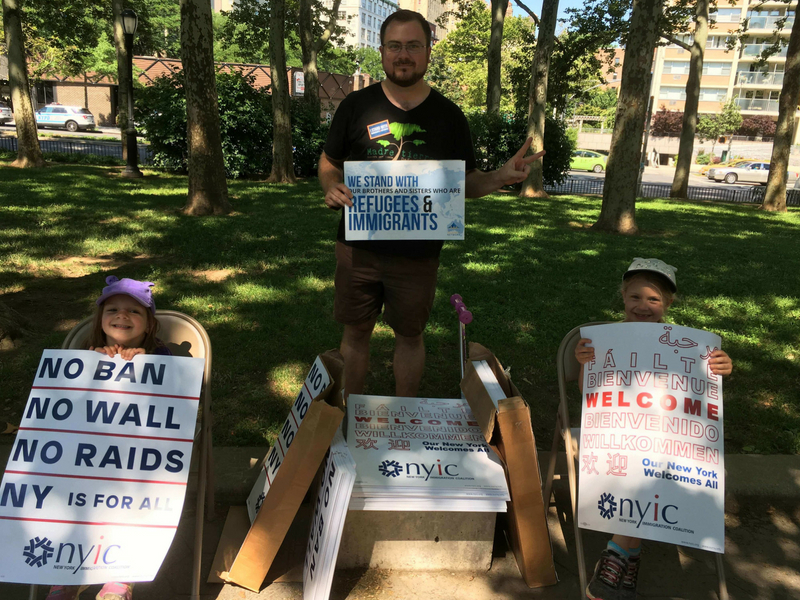 Editor’s Note: The Church of St. Francis Xavier, a Jesuit parish in New York City, works with the New Sanctuary Coalition to engaging parishioners in accompaniment and support work for the immigrant and refugee community in the city. This reflection from parishioner Anne Abbott highlights one individual’s experience of this program. This banner hangs outside St. Francis Xavier in Manhattan. As a parishioner I am grateful for this as well as for the leadership of our pastoral staff and the example of those who worship there with me. 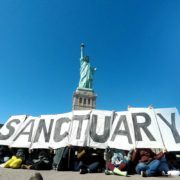 Through them I have felt called to participation in the New Sanctuary Coalition, an interfaith network in New York City standing publicly in solidarity with families and communities resisting detention and deportation in order to stay together. This has allowed me to accompany asylum seekers who are pursuing their dreams to find a haven in the U.S. It has provided me with a way to respond to the injustices I see carried out daily by our government against immigrants and refugees. Recently, the parish offered a course on the Catholic Church’s social justice teaching, including ways our parishioners engage in service to our community. There were presentations on racism, prison ministry, immigration work. We were encouraged to use the Examen to facilitate a direction for ourselves. I found myself drawn to immigration work and attended a training by the New Sanctuary Coalition which confirmed this. At this training, we were taught to refer to asylum seekers as “friends” which opened my heart and mind to the work. I was aware that there are many “friends” among us who have come to the U.S. seeking a better life and in many instances safety and religious freedom. They have children who are U.S. citizens and are contributing to their communities in a variety of ways. Many share my Catholic faith. I am the granddaughter of immigrants who came to the U.S .for a better life. Here they raised children who in turn raised children who have made contributions to our country and have integrated into our society. I feel privileged to have some part in the same process for today’s immigrants and the ways in which I am supported by my parish to do so. 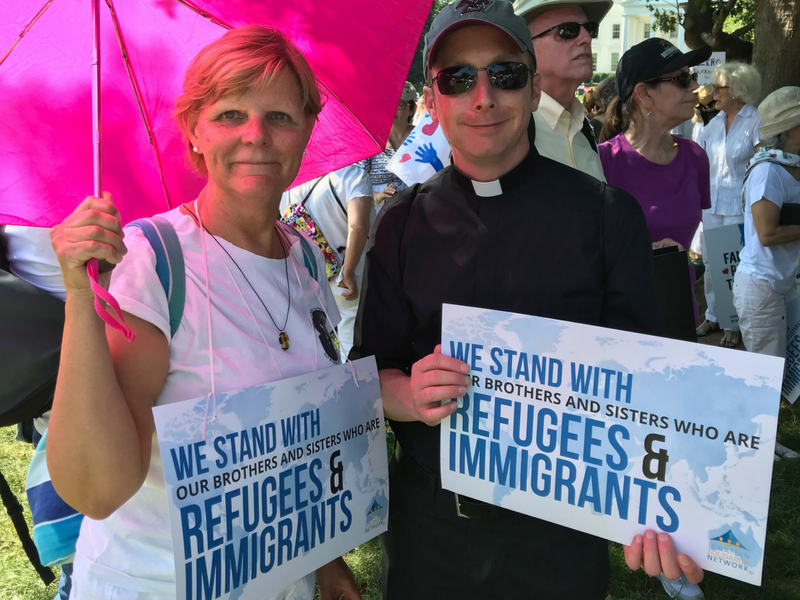 I am a practicing Catholic who takes seriously the call to love my neighbor as myself, to welcome the stranger, to work for justice. When faced with the outcome of the 2016 election I experienced overwhelming feelings of sadness, loss, despair, and anger. 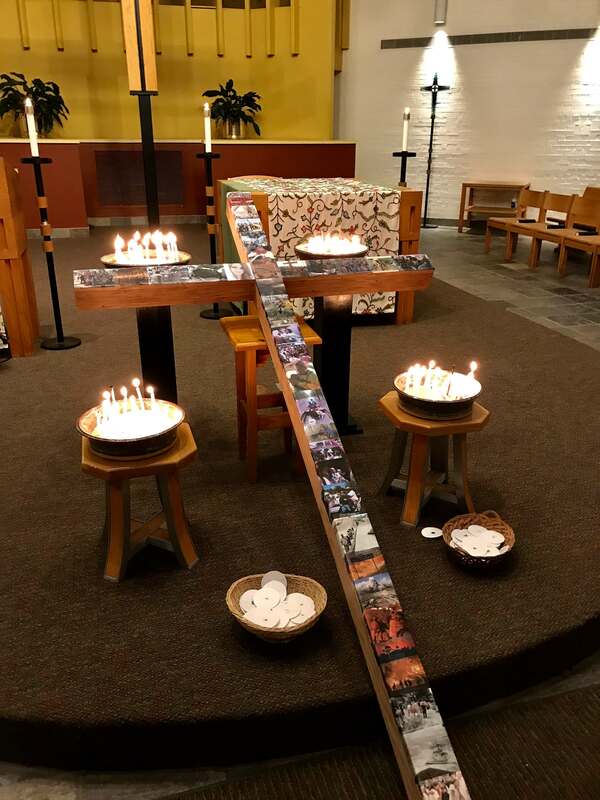 My participation with New Sanctuary and the support of my parish has enabled me to channel these feelings and to practice my faith in real and meaningful ways. Because of them, I have been able to accompany young women who bring their children to ICE check-ins and court hearings. I have been present with the family of a young man who had been in detention while waiting for his asylum hearing. I witnessed the devastation he and they experienced when he was denied asylum and sentenced to deportation. I felt incredible sadness when he turned to us and said, “thank you for coming.” I was grateful to be in federal court when the judge freed Ravi Ragbir from detention, indicating that the government had acted in ways that were unworthy of our Constitution. I am certain that these events are changing me in profound ways that I cannot yet express or understand I only know that this is a journey I am privileged to be on and continue to try to be open to all that it brings. I look to the support of my parish to grow in faith, hope, and love and remain grateful for the opportunities it continues to present. Anne Abbott is an intentional parishioner at St. Francis Xavier, a Jesuit parish in New York City. She is a retired hospice social worker who lives in the Upper East Side of Manhattan. 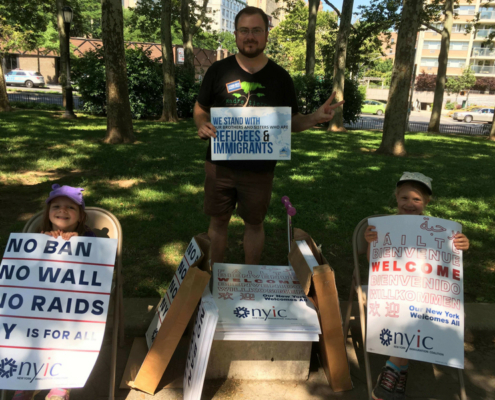 A lifelong Catholic and New Yorker, she participates in the liturgical life of the parish, serves as a Eucharistic Minister at Mt Sinai Hospital, and engages in the parish’s support for immigrants and refugees. The news was stunning; the action devoid of mercy. 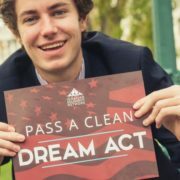 The current administration’s announcement earlier this fall that it was ending the DACA program – Deferred Action for Childhood Arrivals, ran counter to the Jesuit ideals upon which Brophy College Preparatory was built and threatened the futures of Brophy’s Dreamers – young men thriving, excelling, and serving others. 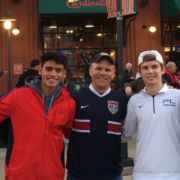 Young men for whom the word “home” means Phoenix, Arizona and the Brophy campus. And then Brophy got to work. The Brophy administration helped DACA families get counseling and legal advice. 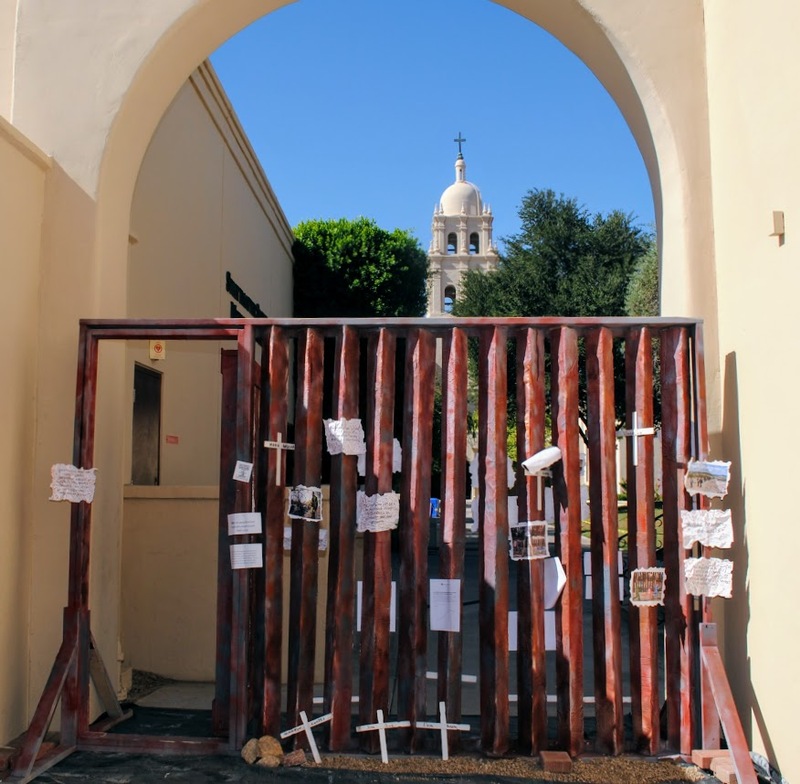 A coalition of student organizations including Kino Teens, The Brophy Advocacy Club, Hermanos Unidos, and the Brophy Culture Project, supported by the administration and the Office of Faith and Justice, launched the DREAM On Campaign. Over the next month, the campaign sponsored DREAM Act advocacy training, three DREAM Act phone-a-thons, a Faces of Brophy event with two of Brophy’s Dreamers telling their stories, and a campus border wall that both memorialized immigrants and activists who have lost their lives, and provided lessons on what it’s like to lose the ability to access safety and a better life. In November, Brophy’s delegation to the Ignatian Family Teach-In for Justice in Washington D.C. met with Arizona Senator Jeff Flake to urge him to support legislation, as well as the staffs of Senator John McCain and Representative Krysten Sinema. Last week, three of Brophy’s DACA students were back in D.C. to work with the Vote4Dream community advocacy group. They met with New York Representative Pete King, and with Representative Sinema’s staff. Brophy College Preparatory students meet with Arizona Senator Jeff Flake at the 2017 Ignatian Family Teach-In for Justice Advocacy Day. 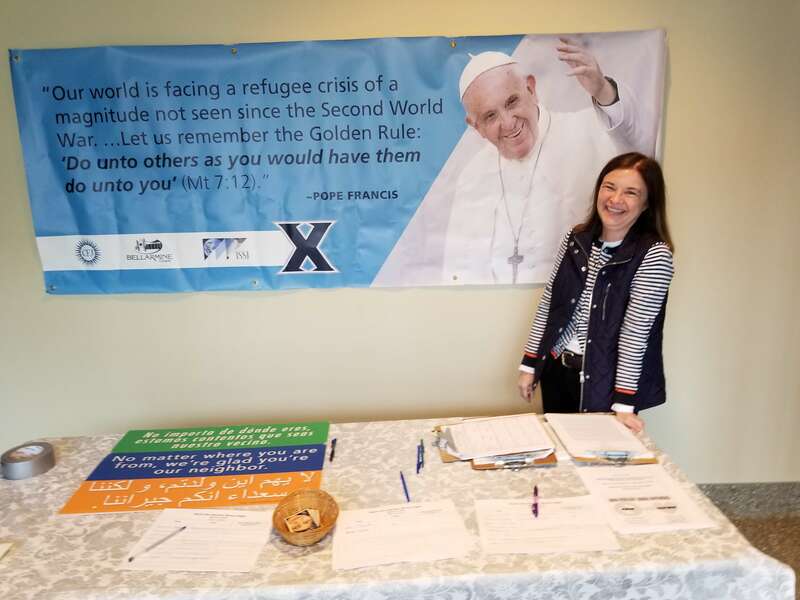 In December, Brophy, Kino Border Initiative and the St. Francis Xavier Parish School came together in solidarity to offer a Novena for Immigration Justice. 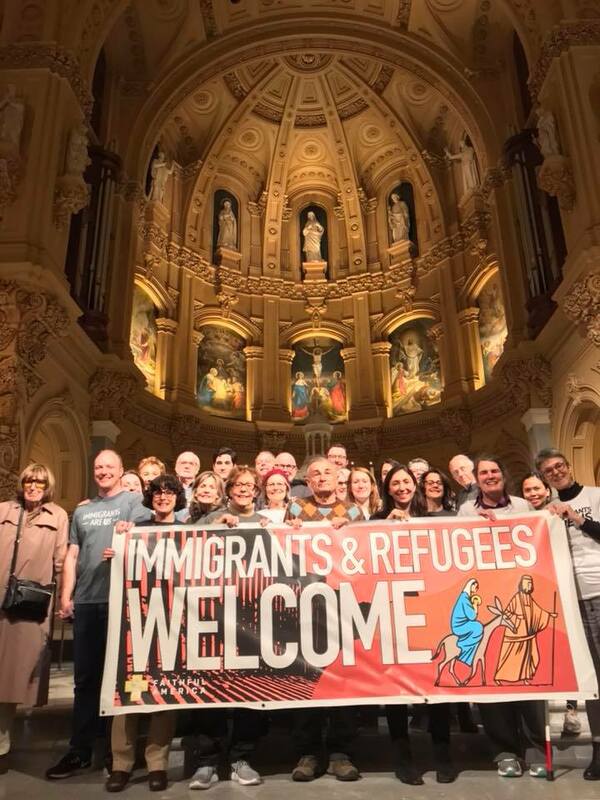 Led by Brophy and St. Francis Xavier students, special prayers for immigration justice were offered on nine successive days. As the March deadline approaches, Brophy will continue to seek legislative reform, support our students, and work for mercy and justice for the Dreamers among us. Kathy Mabry is the director of communications at Brophy College Preparatory, a Jesuit high school and middle school in Phoenix, Arizona. She hopes to continue helping the DREAM On Campaign publicize the meaningful and necessary work being done to support the Dreamers at Brophy and around the country.